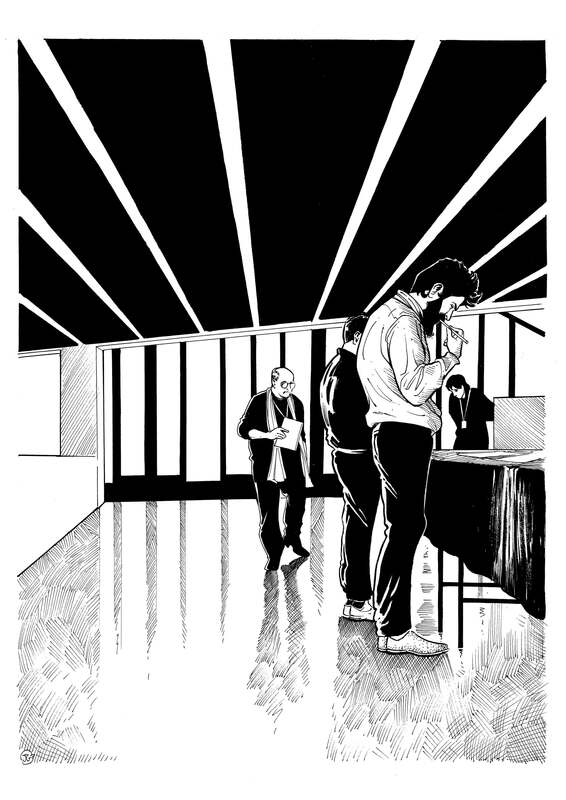 Jandro González is a cartoonist born in Valencia, working and living in Barcelona. Before publishing what it's going to be his third comic book, he collaborated with Solo on the production of the 2016 Laus Annual, provided with fresh aesthetics. This collaboration, offers the perfect setting to talk about Jandro's work, influences and references. The conversation took place in Barcelona in June 2016. Jandro González, illustrator and cartoonist from Barcelona. I have a degree in Fine Arts and Technology in Animation. And why did you end up working in the world of comics? I actually probably work more in illustration. It is very complex to work only with comics, even so, I selected the language of comics because it’s one of the most versatile forms for telling stories. From my point of view, it gives you more control over the end result in almost all aspects of the work. You get the impression that it would be hard to earn a living from comics books in Spain. Is that true or is there a market we are unaware of? It is indeed very difficult to earn a living from comics in this country. 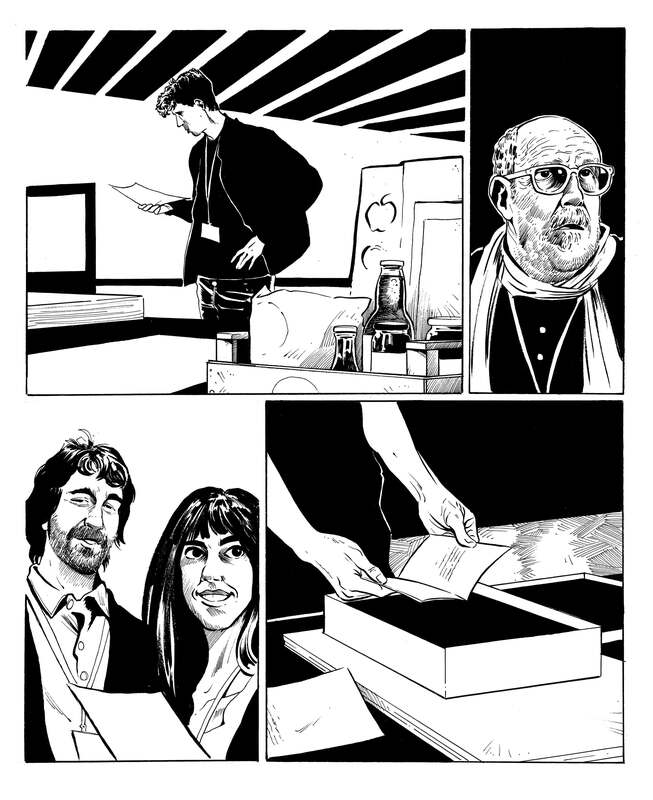 Almost all comic book artists in Spain work in something else to earn a living or, otherwise they work on creating their comic strips for other countries. The works contracts in Spain tend to be very precarious for the authors, as it is more inexpensive and profitable for the publishing houses to buy comics published in other countries that have already met with some success and publish them here. And many of the works that are bought abroad are created by Spanish authors. It’s a way they have to not take risks and not be able to lose money. What is the first comic you remember reading? The earliest memories I have are of small supplements in newspapers like 'El Pequeño País' and 'Gente Menuda' from the newspaper ABC, which had excerpts from different comic strips of any nationality each week. 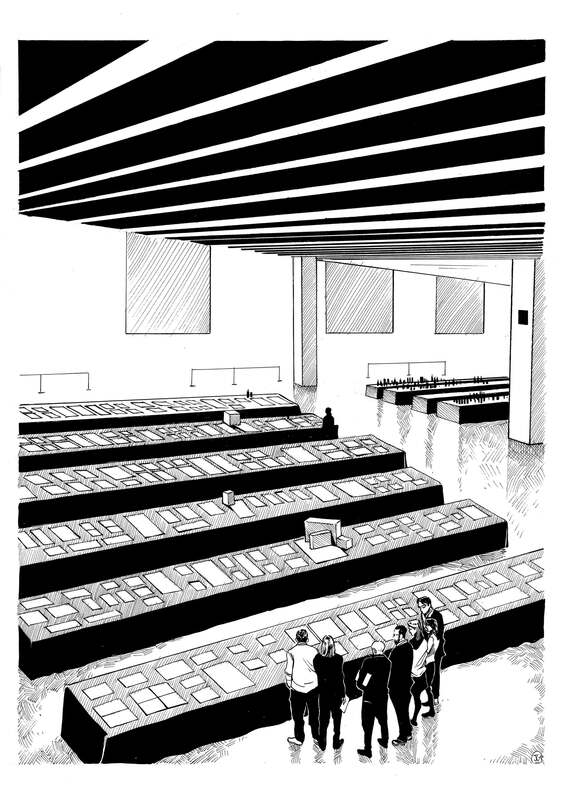 There could be pages from Spiderman, Marco Antonio, Corto Maltese and even Anacleto, Secret Agent, to name a few. It’s peculiar that this type of magazine is practically no longer published in Spain. Nonetheless, if I had to remember which one was the first comic that I read from cover to cover it was definitely some issue of Tintin. What relationship do you think there is between comics and the cinema? They are intimately related. I think that the comic book is the art form most closely linked to cinema that exists. They share things as important as the narrative and planning. Without going into much depth, all film scripts are normally first transformed into a storyboards, which is nothing but a consecutive illustrated narration of the story. It helps everyone involved to understand what needs to be expressed on the screen. There are many comic artists that I am convinced would have been excellent film directors. Why did you agree to illustrate the book Laus 2016? 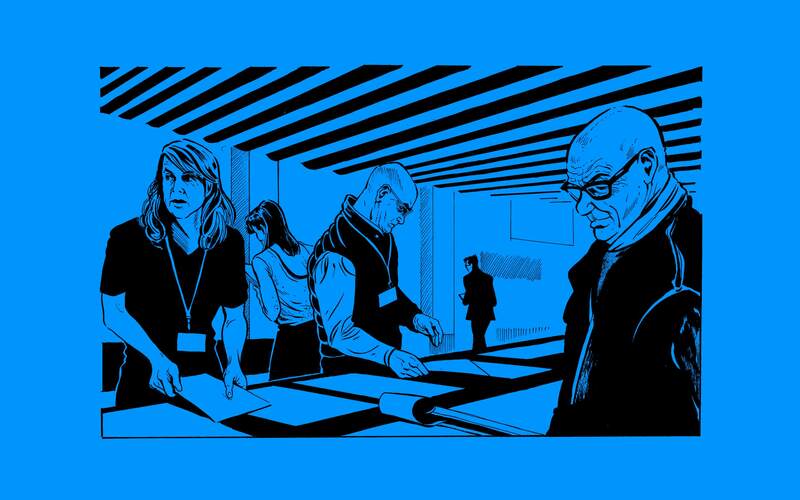 I thought it was interesting to be able to use illustration applied to design and, even more so, narrating events that are related to the graphic designer trade. I thought that—as an author—it could fit perfectly with the initial idea that Solo team had. It seemed extremely bold and innovative to me. I was also very attracted to the spreading this commission could have, with regard to future related projects. Of course, provided that the project concept seemed interesting to me. How do you approach a job like this? I got a general idea of what type of plans I should use and how I would have to narrate the action, but the real starting gun was attending the juries’ evaluations and seeing the space in which they interacted; the way they studied each and every one of the projects and, naturally and most importantly, meeting them in person and seeing them in 'action'. Starting from this experience, the ideas were better organised in my head and the direction I needed to take was clearer, in order to make something that would be really interesting. What was the most difficult aspect of the job? 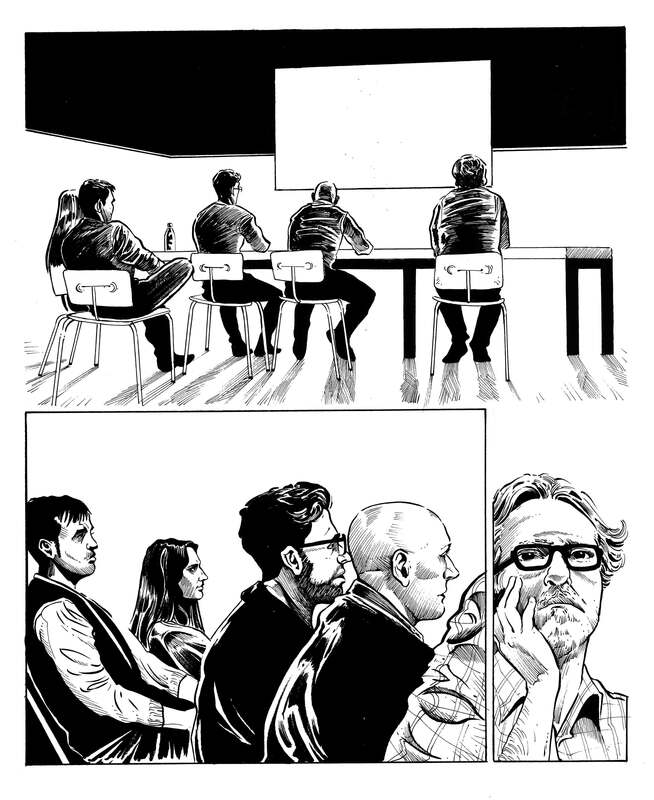 The most complicated thing was to be able to include each and every one of the jury members in such a small space, on so few pages and so few panels. There were some in which up to six people had to appear together in an extremely small space and, moreover, had to all be recognisable by their faces. That was the most complex part to plan. I had to turn to nearly Baroque compositions to be able to put so many people together, especially trying to ensure that all of them had approximately the same prominence throughout the pages. Did you enjoy the process, or did you suffer? I think that all creative processes are linked to suffering. It’s a constant struggle between the results that one wants to achieve and one's own personal limits. However, deep down, it's a very fun struggle. The true satisfaction comes at the end, when the commission is finished and you can more or less see that everything fits together and that the client and general public like the outcome. How do you think an art director should manage a job like this? Do you prefer an extremely delimited task or one that is more open-ended? More visual or more conceptual? Extremely closed commissions have the advantage that there will not be any misunderstandings. You do exactly what they ask you and, if something doesn’t work, it’s because the initial idea wasn’t exactly right. In any case, I think that one has to be intelligent and always add something of themselves, no matter how well-defined and closed the job is that they hire you for. This also tends to add value to the concept, provided that the client knows how to see this value and respects it and assumes it as a bonus for the end result of the work. An art director must know how to clearly express what he is looking for, but must also always be open to letting other's talent add fresh air to his original idea. Me personally, I am more visual than conceptual. In the case of the pages for the Laus awards, Óscar Germade knew exactly how to convey what he wanted me to do. And I was fortunate that his vision matched a style and working process where I feel very comfortable. 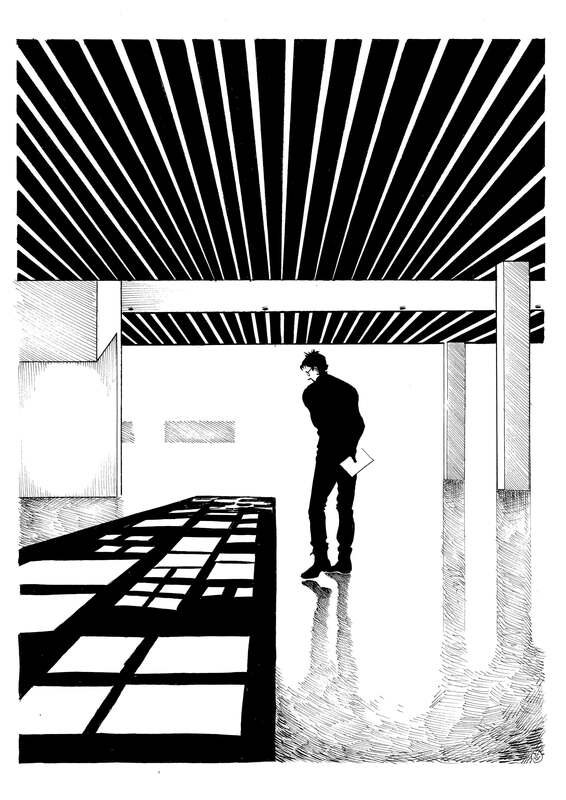 Would you like to continue illustrating for magazines, books, advertising…? Of course, I am passionate about applied illustration. Every job is a new story and every client is a different universe to explore, both for good and for bad. Is it somewhat normal to work for art directors? Is it hard for you to give up complete ‘authorship’ of a piece and put your talent at the service of something that is not a story? Yes, sure, it is normal to work for someone or with someone else’s idea, but one must know very well where they stand in each project. In cinema for example, films tend to only bear the name of the director, but we all know that behind them there is a team of individuals from different disciplines who all contribute what they know to a common project. To me, the director is just as important as the guy holding the microphone a half metre over the actors’ heads. When you work for a design studio, you know that they are the ones who know how to create ideas and conceptualise, but you are the one who knows how to draw. So it is very important to know exactly what you are going to provide from your field to the rest of the professionals who are working on the project. There are projects in which the ego and ‘authorship’ just won’t fit, because you know that you have a common vision and task and that there are people who trust in your know-how and your reputation. It's important for everyone to be rowing toward the same shore. Moreover, I haven’t missed narrating a story, because drawing is so versatile that only by drawing a portrait of a person or a group of people doing something, I feel like I am already explaining something. What is your method for illustrating? Do you use photographs? Do you sketch on paper, digitally…? It depends on what I have to do. 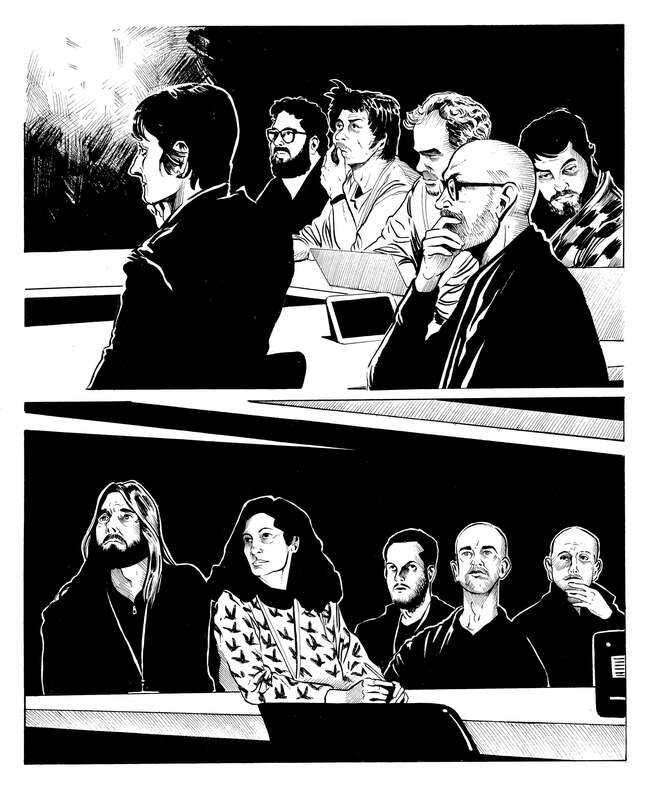 For the Laus awards, I did use photographs to be able to portray the jury members so that my sketches would at least somewhat resemble them. I tend to work on paper first and then scan it and digitally, make corrections and add colours and effects. At this time, I think I am more precise drawing by hand on paper. With the computer, I feel like I lose a bit of the control over my drawing skills. How do you manage to create a consistent narrative with your drawings? Besides trying to be clear with my drawings, so that viewers feel comfortable and can easily read the images, I believe that the composition of each shot is extremely important, as a good composition can tell you a lot more than an excellent drawing. That is something as ancient as art itself, as Michelangelo, Vermeer and Goya all did it and, today, it continues to work just as well. Have you drawn yourself? More than once? Who would you like to draw you? I would like to have Juanjo Guarnido (Blacksad cartoonist) draw me in one of his zoomorphic versions that he is such a master at doing. Do you think that talent or discipline, perseverance, is more important in your line of work? Have you been honest in this questionnaire? All images were created for 2016 Laus Annual. @ Jandro González.